One fine Delta morning, walking along behind Morula, I stumble over a pile of dried dung. An elephant defecates fifteen to seventeen times per day, up to 250 pounds of droppings. If Morula used the same spot each time, as pigs do for their privies, the resultant tally of her daily dump would be taller and heavier than I am. Luckily, elephants leave their leavings wherever they happen to be. Luckily, this pile of dung wasn’t a fresh one. But the one next to it is. I kneel down and take a closer look at Morula’s fragrant pile of feces. Since she’s a vegetarian, it smells more of compost than rot. Crosshatched with undigested twigs, this wet pile contains quite a few seeds. Thirty species of African trees rely on an elephant’s intestine. Passing untouched through the gut, their seeds emerge in the feces, instantly fertilized. I bend closer. Tiny grooves in the sand mark where dung beetles have already rolled off balls of dung. Even tinier footprints dot each groove. With its hind legs, a dung beetle can propel a ball of dung 1,041 times its own body weight – equivalent to me, lying on my back, trying to push around Morula with my feet. One study found 22,000 dung beetles on a single elephant plop. Dung beetles enrich the soil, prevent the spread of parasites and disease, and provide food for their young, night and day, day and night – finding their way around at night by polarized moonlight. A dung beetle barrel rolls past my ear and lands on top of Morula’s output. Tightly rolled bits of it are already making off into the grass, propelled by industrious hind legs. As the male rolls his ball of dung, a female rides on top. She will lay her egg on it once the ball is buried. In less than an hour, most of this pile will be gone, entombed in tiny birthing chambers, each ball of dung containing a few seeds and a single egg. When the beetle larva hatches from the egg, it has all of the food and water it will need until it is able to function on its own. There are 1800 species of dung beetles in southern Africa – 1800 tribes of sanitary engineers cleaning things up. Worldwide, the dung beetle family includes 5,000 species. In the United States there are 90 species. 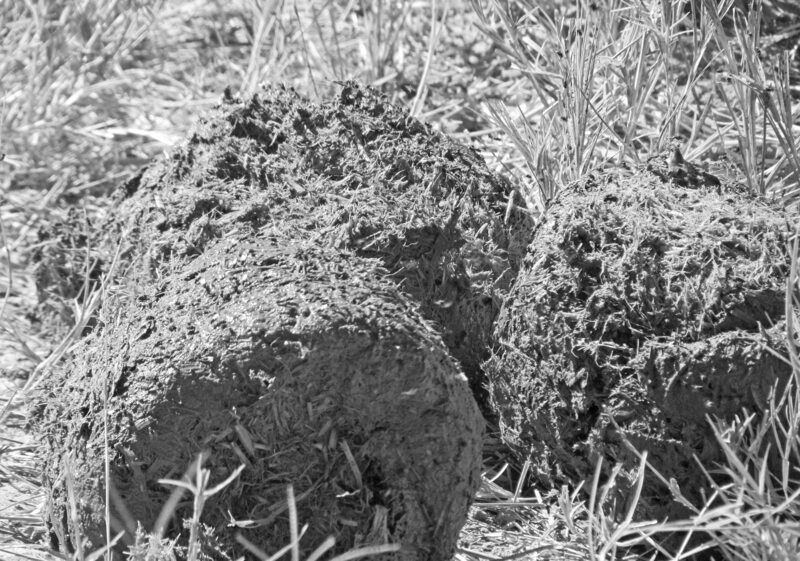 Ranchers love them – an established population of dung beetles can clear out a cow pasture in thirty-six hours. Australians import African dung beetles to augment their native population and are experimenting with them in big cities to rid sidewalks and streets of dog droppings. In East Africa, dung beetles work their way through eighty percent of the leavings left behind by the mass migrations on the Serengeti. Without dung beetles all of Africa would be covered with, well, you know. 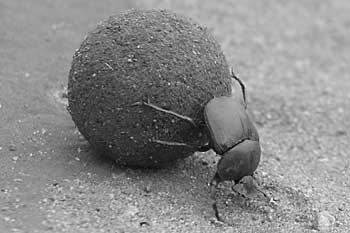 I have heard of these insects of course, but I had no idea they made such perfectly round balls of dung or that they were so efficient at cleanup. They are an essential species indeed. Curious about your comment regarding the potential for dung beetles to clean up dog feces, I looked them up to find out if they are particular about the meat-or-non-meat eating proclivities of their sources. According to Wikipedia, (not that I would ever swear to anything posted there) they’ll eat either, but prefer their dung from herbivores. Interesting. Interesting info on the feces of meat eaters! I didn’t know that – I rarely use Wikipedia except to verify general things I think I know – and I wonder if the folks in Australia know. I usually Google for more esoteric tidbits and tend to cruise through scientific papers (cruise in terms of fly-bys). Have met a few bug folks online and their websites are always interesting. For the book, though, I try to keep things general. Thanks for your feedback!